By Tuesday night, I was completely packed and ready to go. Unfortunately, it was a full two and a half days before I planned on leaving for the 2012 Rat Race in Ruch, Oregon. This was turning out to be a long and painful week of waiting. The following day at work was sheer torture watching the spot tracking of pilots flying effortlessly from peak to peak in the Applegate Valley. A few of my friends had left a week early to get used to the air, a brilliant move from what I could tell sitting in an uncomfortable office chair. My wife found me that night pawing over my paragliding and camping equipment for the hundredth time, so I’m sure it wasn’t a huge surprise when I begged her for permission to leave a day early. I was a sad and pathetic sight to behold. Arms stretched over the gear spread across the floor, face contorted in a pouty grimace, I pleaded shamelessly that I just had to go. She quietly took the whole scene in and then slowly broke out into a small smile. “You are so cute.”… Success! By 2PM the next day I was southern Oregon bound. I arrived on top of Woodrat Friday morning, just in time to cook a nice sausage and egg breakfast while waiting for others to show up. It was shaping up to be a great day weather wise, completely sunny and 85 degrees with a slight breeze coming up launch. Seeing a forecast of 55 and rain in Seattle gave me a chuckle and confirmed I had made the right call to flee. By 1PM I was in the air and climbing gracefully with other giddy pilots. 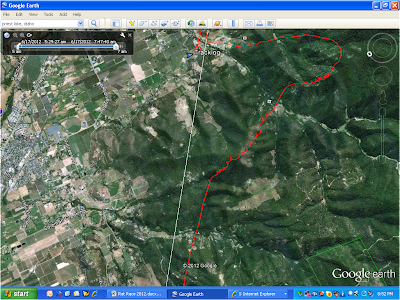 I headed over to Rabies with Randy Lettau and we caught a nice thermal up the ridge. The thermal triggers were as obvious as I had remembered them to be, just head towards the bald rocky slopes that face the sun and hold on for dear life. Eventually I drifted over Mt. Isabelle and found myself alone and wondering what the next move was going to be. That’s when I spotted three Niviuk Artik 3 wings heading northbound towards Grant’s Pass. Making it to Grant’s was a personal goal of mine so I quickly made the decision to give chase. We stuck to the high ground in order to make the challenging Humbug valley crossing and continued on with a “Get High/Stay High” mentality. It paid off and after three hours I finally managed to sneak over the last ridge into town. One really cool thing happened during that flight. A huge meteor went overhead from south to north and sparkled brightly above one of the Niviuk gliders. I really thought it was going to destroy Grant’s Pass but it fizzled out some 20 miles up in the atmosphere. Another interesting point I discovered after the fact was that the Niviuk Artik 3s I followed turned out to be DHV 2-3 Icepeaks. I’m just glad I didn’t know that at the time or I probably wouldn’t have tailed them on a 1-2 Nova Mentor! All in all, that 1st flight from Woodrat did wonders to bolster my confidence, and the cold beer and ride back from fellow NW pilots Jeff Slotta and TJ Sopher put me in the right vacation mindset. Saturday was a practice day which I desperately needed to get reacquainted with GPS route finding. 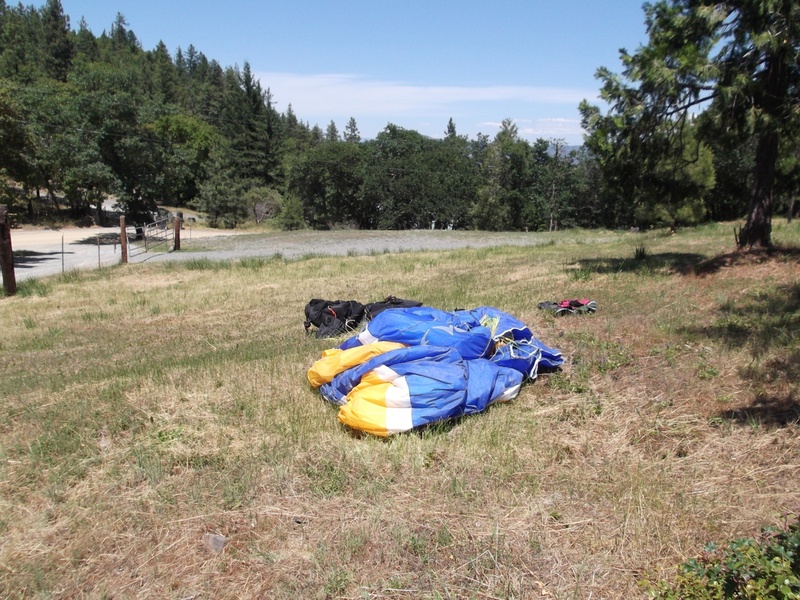 The task was called for the Sprint group – Woodrat, Lower Rabies, Rabies Peak, Woodrat Launch and finishing at Hartz LZ. I’ll admit that I was more than a little nervous heading into battle that morning. During last year’s Rat Race I personally witnessed two mid air collisions when we were all swarming together before the start. I couldn’t see it getting a whole lot better considering there were more contestants this year than ever before. However, race director Mike Haley instituted a staggered start approach right from the get go and it did wonders to clean things up. Perhaps I’m wrong, but I am not aware of a single mid-air occurring all week long. Day 1 task was Woodrat-Rabies-Burnt-Cemetery-Donato, a fairly good sized task to accomplish on the first day. I decided to play it cautiously and allow others to lead out and mark lift. That left me in 7th or 8th position most of the race, but only a thermal or so away from the lead gaggle. After tagging Cemetery I couldn’t believe my eyes. The entire group in front of me was on death glide, bombing out one large ridge shy of goal! The unfathomable idea of actually being able to win this task all of a sudden became a distinct possibility. Ok, I told myself, let’s not dart straight down the valley like they did. Instead, veer right and claw the ridge to maintain altitude. It worked perfectly and I managed to meet up with the Race group heading to our goal. That’s when it struck me. The Race group (Pro’s) didn’t have the same goal as the Sprint group (Not Pro’s). I looked down at the Garmin that I stopped referencing after having a “visual” on goal. It was pointing me back and to the east. Oh no…the Sprint group in front of me did not bomb out, they landed right at goal! I turned around and made it back, but lost about 8 positions due to that mistake. The shape of my flight track was literally a huge question mark outside and around the 2K ESS goal cylinder…As if to say, what in the hell were you thinking? Day 2 task was Squires-Rabies-Burnt-Jacksonville ZL-Dark Hallow. It was set as a modest task since less than 25% of the pilots made goal on Day 1. However, super lifty conditions were present enabling over 40 pilots to quickly blast through the course. I once again stuck with the conservative tactic and ended up at goal about 2,500 feet higher than needed. I was having a really good time flying that day so I decided to keep going. Why not when you come into goal that high, right? 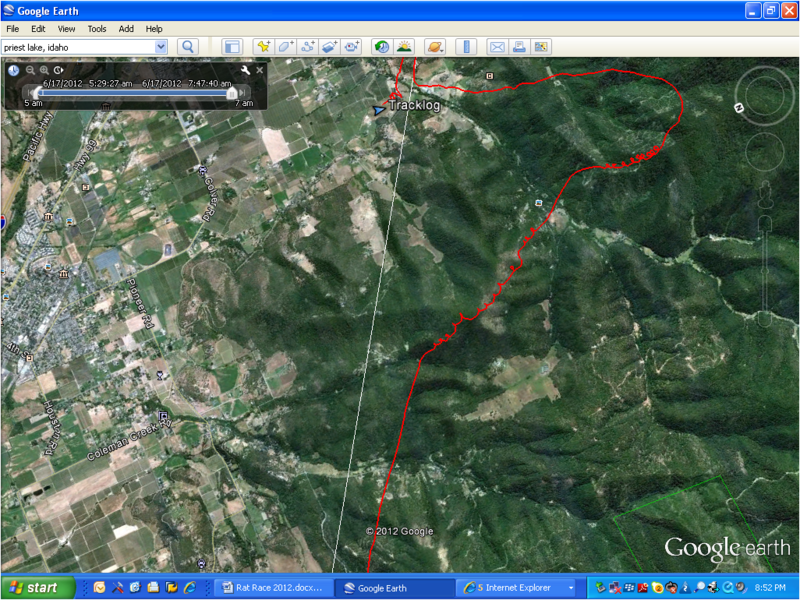 Instead of heading downwind I made a half hearted attempt at reversing through the course back to Woodrat. The strong northwest wind made progress in that direction impossible and I soon found myself back at Hallows pulling deep spirals to get down the last 200 feet to the ground. I’m sure more than a couple of pilots along with myself are still wondering why they didn’t continuing downwind that day as an additional 30 or 40 miles was more than likely attainable. I finally made it through the carnage and got established on Rabies Ridge only to blow it all by thinking it was a great idea to head into the shaded lee side of Rabies Peak. It wasn’t, and I ended up dirting out way up in China Gulch. Let’s just say that’s not an LZ I’d like to revisit anytime in the near future. After packing up I was happy (sort of) to see TJ Sopher, a fellow NW DHV 1-2 pilot, fly by and tag Rabies Peak. He was on the short list of pilots who made goal after a grueling day of flying. Excellent job! Day 5 task was Woodrat Launch-Burnt-Rabies-Burnt-Jacksonville LZ-Donato. After not making goal the prior day I was completely focused on finding lift and getting the job done any way possible. That mentality worked really well until I hit the fingers above Dark Hollow. I figured it worked on Day 1 to stay up on the ridge so it should work again. What I failed to take into account was the fact that the conditions were completely different than before. Others may disagree, but it seemed to me the air got less buoyant as the week progressed this year. Regardless, the end result was that I soon found myself being flushed into a tight gulch with extremely limited landing prospects. My options were 1) land on the roof of a large house 2) land in the sunny leeside of a small gravel pit, 3) land in a tree, or 4) go for a postage stamp sized grassy area surrounded by tall trees. I chose the last option and went for it with all sensors on high alert. About 100 feet away I noticed this nasty little LZ held an added surprise…Power lines! Not cool, but it was too late to alter course. This may sound really weird, but I decided the plan of attack was to aim directly at the power lines and then turn to final. The reasoning was that I would at least know when I couldn’t go any further in that direction, then I could just turn and deal with what’s straight ahead. Be it a tree or barbed wired fence (both definite possibilities) it would still be better than frying on a wire. I cleared the front trees by a foot or so, leaned right towards the lines and then immediately banked hard left at the last possible moment. Several flares on the brakes dropped me a few feet shy of the trees and barbed wire fence. I’ll be honest, I couldn’t have made this landing 2 out of 10 times, but the Gods for some reason were smiling on me that day. I’m also thankful that I was flying a 1-2 wing because attempting it on a 2 or 2-3 with their extended glide ratios would have ended messy for sure. Bottom line is that I learned a valuable lesson that day. I had competition blinders on and put myself into a position I simply shouldn’t have been in. My internal voice screamed at me “Keep it safe for God sakes man!”… OK. I hear you. Good point. Sorry. Won’t let it happen again. The final two days of the Sprint race were cancelled due to rain, so when the dust settled I managed to come in 12th place in the Sprint Sport and 1st place in the Sprint Super Standard division (read: 1 and 1-2 gliders). I was happy with my performance but more importantly I had a blast hanging out with friends while significantly improving my flying skills. Congratulations to Mike and Gail Haley for once again holding a fantastic event in an absolutely beautiful location. Also, a huge thanks to all the volunteers that helped make it a success. Now the only question I have is...When should I start packing for next year?